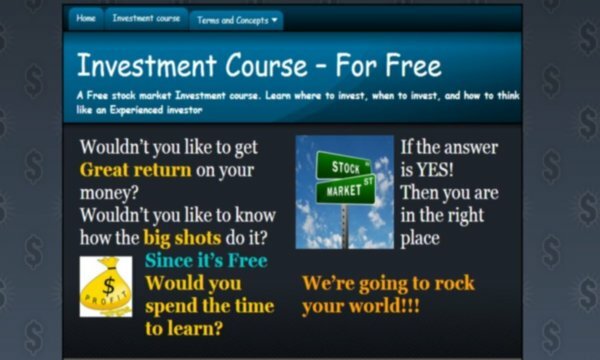 A FREE Stock Market Investment course! Wouldn’t you like to get Great return on your money? Wouldn’t you like to know how the big shot investors do it? Would you spend the time to learn? 1. Starting from the basics - Bonds, Stocks, Funds, ETF, FOF, etrade etc. 2. Learning how to calculate shares real value and how to pick outperforming stocks - Fundamental analysis investment. 3. 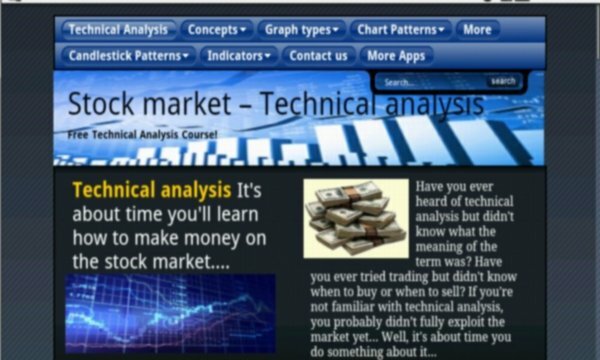 Learning the Technical analysis methods of investment. We guarantee! You will know how to pick the right stock share and you will outperform the market for the long run, and how to etrade it - but only if you'll spend the time learning and practicing. Investing on stockmarket can be simple, if the investor has good background and pre-decided plan. Learn to invest like the big guns, be the investor who knows what he's doing, knowledge is power especially when it comes to investing in stocks, bonds, funds, ETF, and more. Any one should know at least the basic of intelligent investment. even if it's just for a retirement portfolio that makes sure your capital is getting bigger, you wouldn't be the loser of the interests but using basic things like bond, etfs and stocks will help you understanding the advisors. usaa, scottrade, etrade,schwab, vanguard, sharebuilder, ameritrade, optionsxpress, zecco, janus, thinkorswim ect. You'll find it all in this free etrade investment course app.